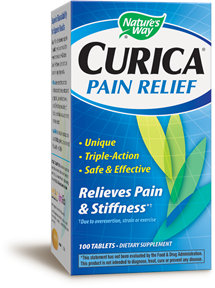 Curica® Pain Relief provides superior bioavailability of curcuminoids (from Meriva® turmeric) and AKBA (from AprèsFlex® boswellia) into the bloodstream for long-lasting results. Meriva is a researched complex of standardized turmeric extract and phosphatidylcholine with up to 29x better bioavailability of total curcuminoids versus an ordinary turmeric extract. AprèsFlex is a boswellia extract with a standardized potency and enhanced bioavailability of AKBA.